With over 800 million followers of Hinduism in the world, you can bet there are a bunch of Hindu weddings happening all over the place - from Bangladesh to the UK. The Big Fat Indian Wedding is here to help. With the Essential Guide to Hindu Weddings, we'll tell you all you'd ever need to know about how to throw (and attend) a Hindu wedding. Now there are a ton (A TON) of variations when it comes to Hindu weddings. You have your Panjabi Hindu, your Tamilian Hindu, your Fijian Hindu, and on and on. Each will have their particular spin on the ceremony, the clothes, the food, etc. We are planning to do guides on every category and subcategory of Desi weddings, but until then consider this your Essential Guide to the basic Hindu wedding. Hindu Wedding: Introduction – You’re here! According to the Vedas, the oldest set of Hindu scriptures, the Hindu marriage is for life. It is meant to tie two individuals together so that they may pursue their dharma, or duty, together. At the end of their lives they give themselves over to moksha, the ultimate spiritual release and the end of their cycles of rebirth. True love, in Hinduism, is being reborn with your soulmate in each cycle of reincarnation so that you may both be together forever. The Vedas list out 8 different types of Hindu marriage and they range from a father giving his daughter in marriage to her bridegroom to a woman being forcibly married after she has been abducted from her home and her male relatives have been slain. Now, thankfully, Hindu marriages are only legally binding when both the bride and the groom give their consent, are of a legal age, and are not already married to a person still living (no polygamy or polyandry allowed). Even the ancient tradition of dowries has been made illegal (phew!). 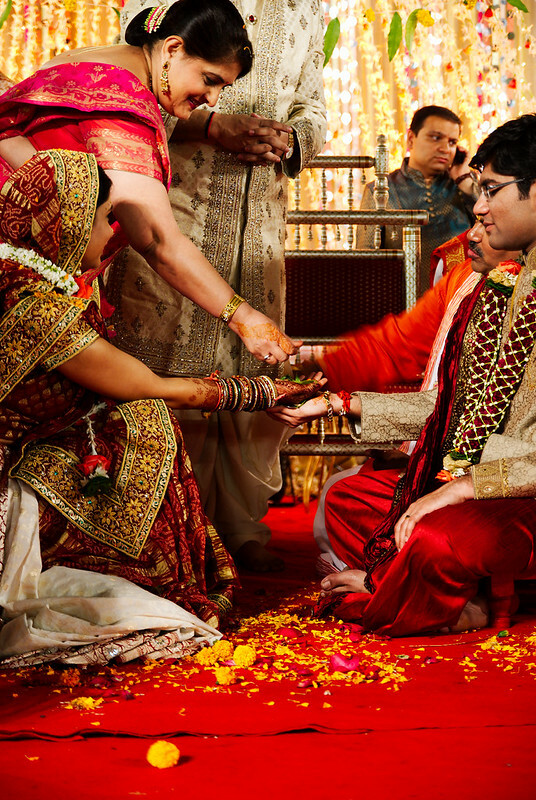 Hindu marriage traditions vary from state to state and community to community. But what is common amongst all of them is the belief that the wedding isn't simply the union of two individuals but rather two families. The families at a Hindu wedding play very important roles throughout the ceremony, as we'll see in the rest of the series.